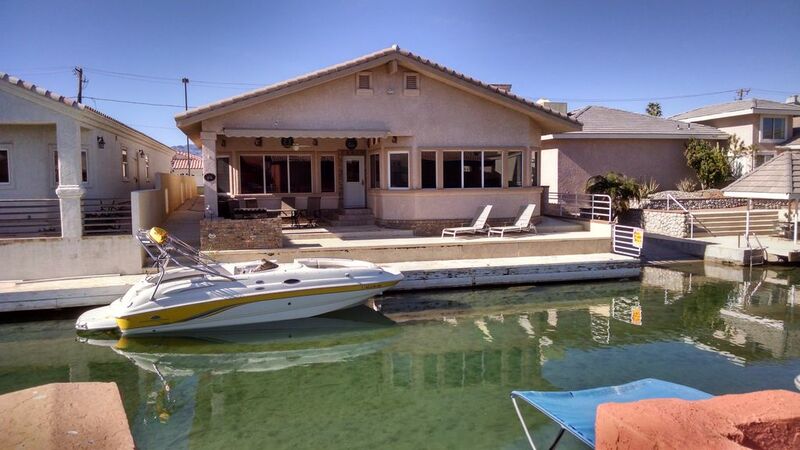 Waterfront home, three bedrooms, three bathrooms with a 4-car garage to park you vehicles, motorcycles and off-road vehicles in an exclusive gated community, the Lake Moovalya Keys on the Colorado River, located along the Parker Strip, in Parker, Arizona. Launch your boat once when you get here and keep it on the dock until you leave. You'll be spoiled being able to drive your boat up to your very own safe & secure boat dock and walk into your house without the worries and hassles of mooring or docking your boat where you can't be sure it's safe and secure. The Parker River Rental House is located right on the river in the private 'No Wake' canals - this gives you calm water and an area for the kids & dogs to swim, play or just float on a raft in the canal just steps from the house. Huge windows along the entire back of the house provide a panoramic view of the canal. There is 50 feet of private dock in a 'No Wake' that runs the length of the property, for your boats, jet ski's and toys in full view of the patio right outside your back door. The canal leads out to the Colorado River giving you boating access to 15 miles of beaches, sandbars, riverfront restaurants, bars, such as the new Pirate's Den, Roadrunner, Fox's and the Blue Water Casino. Moovalya Keys is a gated community with canals running thru it, 2 boat launch ramps and 2 entrances via water to the Mighty Colorado River. The Master Bedroom has a California King Bed and the two Guest Rooms each have a Queen, Full and Twin beds for a total of seven beds. Each bedroom has it's own bathroom. The large, fully equipped kitchen has everything you need to prepare great meals for family and friends. You'll have morning sun and evening shade to enjoy Bar-B-Queing on the patio with the built-in gas BBQ on the patio while you watch the boats go by. We have made many upgrades to the house with new interior paint, sofas, A/C Units, window blinds and a general updating. Lake Havasu is only a few minutes away just past Parker Dam if you wish to launch your boat for a day on the lake. Lake Havasu City is only 30 minutes away with the famous London Bridge, shops, restaurants and nightclubs for your enjoyment. Some of the best Off-Roading is always available especially when the weather cools off during the winter months with the Desrt Bar always a great riding destination with the many Arizona State Off-Road Trails clearly marked. Large Sub Zero Refrigerator in kitchen and refrigerator in wet bar. Large open kitchen with huge breakfast bar. All dishes and cookware are supplied. 47" Flat Screens in the Great Room with a Pool Table and 15' Wet Bar. TV in Master & Kitchen. View of Canal and 50' Boat Dock with BBQ, table and chairs. 50' Boat dock on your back patio in a 'No Wake Zone' canal leading out to the Colorado River with 15 miles of beaches, sandbars, riverfront bars and restaurants and the Blue Water Casino. Moovalya Keys is a gated community with canals running thru it, 2 boat launch ramps and 2 entrances via water to the Mighty Colorado River. The Parker Strip offers some of the best waterskiing, wakeboarding all around water sports in the country. The Parker River Rental House is located right on the river in the private 'No Wake' canals - this gives you calm water and an area for the kids to swim, play and float out in the canal just steps from the house. Huge windows along the entire back of the house provide a panoramic water view of the canal. There is 50 feet of private dock. The house layout is excellent! All enjoyed the pool table and bar (after it was stocked). We were disappointed to find the utensil drawers filthy and rotten potatoes in the cupboard. Perhaps you need to have a discussion with your cleaning crew. The carpets either need to go or at the very least need cleaned! And, mattress pads on the beds would be nice. We also felt the need to scrub the bathrooms. The use of the "clean" garage was awesome. In spite the need for cleaning, which shouldn't have been necessary, we enjoyed our stay. The property was a perfect location. We really enjoyed our stay and the accommodation's we're excellent. The house has all the amenities you to have a good time. Large open concept plus pool table and bar. Great for large groups and convenient location. We are glad you had a great time! Come back and stay with us again. Nice location. Easy access right on the water. We had a wonderful time playing pool, bbqing and just hanging out. Thanks for the great review Theresa, we are glad you liked the house and had a great time! Come back and stay again! I rented the home for around 25 days and it couldn’t of worked out better. Great home secure location and Lance was unbelievable to deal with. I highly recommend this place!!! It was great to have you stay as well and we appreciate your review! We hope to have you stay again in the future. This house was spectacular. Perfect for our anniversary getaway. Will definitely be back. We enjoyed our stay on the river this weekend. It was very relaxing & comfortable staying at this location. It was great having you as a guest! Off Roading During The Winter Months, Bluewater Casino, Roadrunner, Fox's, Badknock's, Parker Strip, Desert Bar.